Konica Minolta is preparing more than ever for Drupa 2016, intending to be clearly identified as one of the market leaders in digital production printing. At drupa this year, the Japanese manufacturer is officially launching new B2+ cut-sheet UV-cured inkjet press, the KM-1. This duplex digital inkjet press uses UV-curable inks and cool LED lights, which mean that it print onto a very wide range of media (including standard offset papers, and quite complex stocks). It can print onto card up to 0.6 mm. In terms of productivity, the KM-1 can print up to 3000 B2+ sheets per hour (1,500 sheets in duplex mode) with variable data and at a resolution up to 1200 dpi. The large size of the cylinder means that curling is effectively minimized - and it contributes to highly consistent registration and high quality printing. The KM-1 will be initially marketed for "Wide Gamut" CMYK, with the possibility of adding a fifth and sixth color option at a later date. 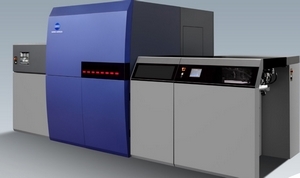 Konica Minolta has designed this machine for commercial printers wanting to widen their product range embracing the possibilities, efficiency and productivity of inkjet printing. The manufacturer is highlighting that this press is particularly well suited to widely varying run lengths, and is a wide solution for an offset provider wishing to have a digital option. DataMaster will be present at Drupa 2016, which will be held from 31 May to 20 June in Düsseldorf, Germany.